VertaseFLI was contracted for the remediation of groundwater and impacted soils on a site near Peterborough. The site was proved to be contaminated with a wide range of chlorinated solvents that were stored on site in a series of above ground tanks over the past fifty years. To compound the problem at the front of the site there was a launderette which had also contributed some chlorinated contamination. A series of site investigations and assessments were undertaken, whereby the natural degradation of chlorinated solvents was monitored. An options appraisal was completed by VertaseFLI with a number of different remedial techniques evaluated. Dual phase vacuum extraction (DPVE) was adopted due to the prevailing groundwater regime involving a shallow groundwater table within a sequence of low permeability silty clays, peat horizons and sands. DPVE allowed for the removal of suspected DNAPL’s in the groundwater column as well as the collection of groundwater and soil gases in the unsaturated zone. A pragmatic and cost effective solution was offered, which was also perceived to be the least intrusive technique within a quiet rural area in close proximity to neighbouring houses. 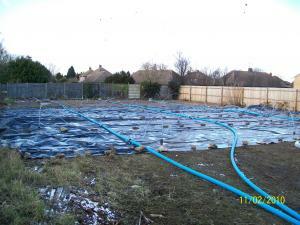 A 12 month remediation programme was formulated and agreed with the local authority and Environment Agency. 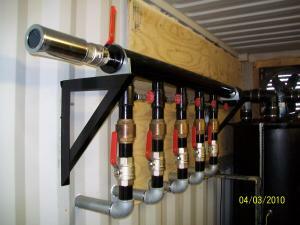 The remedial targets for the chlorinated solvents were based upon a betterment approach using the BATNEEC approach. This approach embraces the concept of recovering as much of the contamination as possible within a cost benefit framework and an achievement of asymptotic recovery of the mass flux. 55 extraction wells were extended at least 2m into the saturated zone. The extent of contamination (both laterally and vertically) was continually re-assessed during well installation to ensure proactive decisions were made based on site conditions. The programme dictated that all 3 zones be subjected to remediation simultaneously requiring pumps and blowers of considerably larger capacity than normal. The process plant was designed, built and maintained in-house.